Emperor Goose: Have you seen this bird? The Emperor Goose (Chen canagica) is a species of goose. 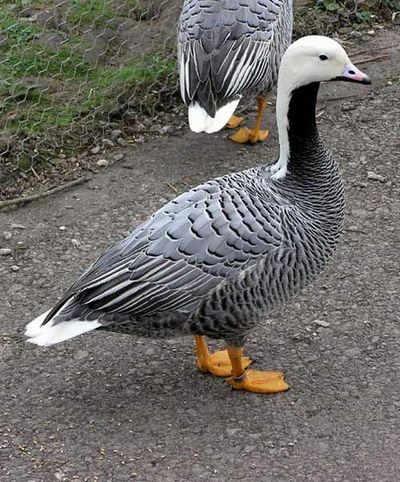 The Emperor Goose is a small stocky goose found in Alaska and nearby parts of Russia. Breeding: They breed on coastal tundra, laying 3–7 eggs in a ground nest. The Emperor Goose breeds primarily in western Alaska, and in Russia flanking the Bering Strait. Gray body with black and white feather edging is distinctive. Food: Emperor geese feed on seaweed, eelgrass, algae, beach rye, beach pea, sandwort, grasses and sedges, crowberries, mollusks and crustaceans found in intertidal areas, salt marshes and tundra meadows. Population: Alaska’s emperor goose population declined greatly from 139,000 in 1964 to 42,000 in 1986. Please submit bird quotes, or your own bird quote. Enter the bird quote for others to enjoy by filling out the Submit form on the menu. Bird, birds, Chen canagica, Emperor geese, Goose, stocky goose, Television, Television is a golden goose. Bookmark.